Mixed colours but not of the vibrant shades i call this sherbet mix as it reminds me of them. A mix of flowers and varieties n.b these may vary from the pic as it is just an example of one previously made, generally a mix of pink, lilac/purple, lemon and white/cream. 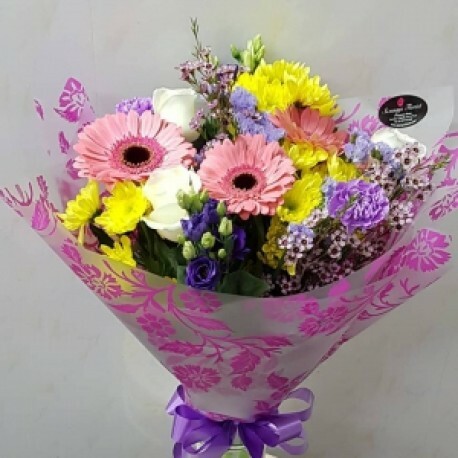 We offer this in three main sizes but just adjust in between those prices if you wish to go mid of those prices, any dislikes or preferences of flowers, lilies for example please state as though not pictured they can be added or if recipient dislikes please state and we will leave out. n.b bouquet pictured is of higher value than the starting price.